Coby's MP828-4G 2.8" Touchscreen Video MP3 Player provides great design and numerous entertainment options at a budget-conscious price. 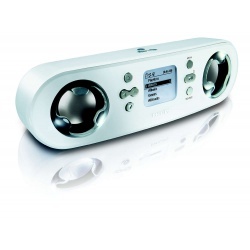 Enjoy your personal music collection, the FM radio, videos, photos and text, along with a 0.3MP digital still / video camera. 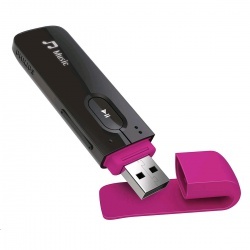 Store your files to the built-in 4GB flash memory, with the option to carry even more media using miniSD cards. Additionally, the MP828's 2.8" touchscreen display provides a generous platform on which to search menus, find stations, view album art, and enjoy your videos and photos; while the integrated speaker frees you up from headphones and lets you share. Box Dimensions (LxWxH) 8.2 x 6.0 x 1.5"
workout music - 100% skip-free. Add more songs via the mini SD card slot. When you're on the go, does the quality of your favorite music travel with you? Or does the full sound experience get left home? 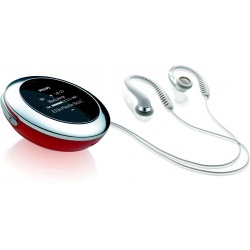 The Philips GoGear with FullSound was created to enhance the sound quality of your MP3 music while you play it. Now you can experience your music on the go as never before.Want to get out everything from your MP3 files? With Philips FullSound you can. This unique feature upgrades the regular MP3 performance to a high quality audio experience. Together with Philips superior quality headphones, your MP3 music really comes to life!GoGear portable audio players were made for you to experience your audio and video content, where you want it and the way you want it to. The intuitive user interface makes file storage and access easier than ever. That's all your entertainment on the go.The GoGear is lightweight and compact so you can carry it easily, with a simple-to-use menu. As well as listening to more dynamic-sounding music with FullSound you can watch high quality video, store and view photos, and listen to FM Radio. There is also a built-in microphone so you can record your own voice.